It marked only the third time in World Series history in which both teams had the same home field (the other two being the 1921 and 1922 World Series in the Polo Grounds in New York City). 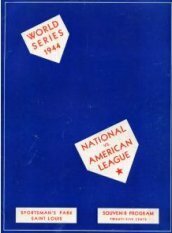 1944 saw perhaps the nadir of 20th-century baseball, as the long-moribund St. Louis Browns won their only American League pennant. The pool of talent was depleted by the draft to the point that in 1945 (but not 1944), as the military scraped deeper and deeper into the ranks of the possibly eligible, the Browns actually used a one-armed player, Pete Gray. Some of the players were 4-Fs, physical rejects whose defects precluded duty in the trenches but not limping around the bases of ballparks. Others divided their time between factory work in defense industries and baseball, some being able to play ball only on weekends. Some just plain got lucky. Stan Musial of the Cardinals was one. Musial, enlisting in early 1945 but never called, was able to stay with his team throughout the war. The Browns, on the other hand, were not so fortunate, and their 1944 team was a patched together fabric of those ineligible for military service, virtual misfits, alcoholics and retreads who somehow managed to win games. 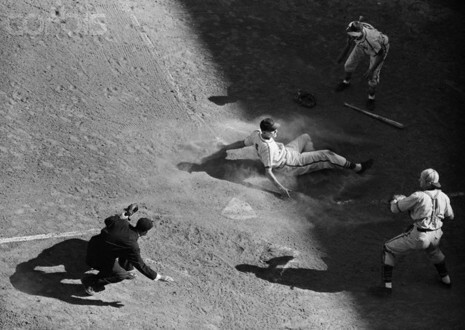 As both teams called Sportsman's Park home, the 2–3–2 home field assignment was preserved. The Junior World Series of that same year, partly hosted in Baltimore's converted football stadium, easily outdrew the "real" Series and attracted attention to Baltimore as a potential major league city. Ten years later, the Browns transferred there and became the Orioles. Another all-Missouri World Series was played 41 years later, with the Kansas City Royals defeating the Cardinals in seven games. The Series was also known as the "Trolley Series," "Streetcar Series," or the "St. Louis Showdown." The ongoing war between the Allies and Axis powers certainly had an impact on Major League Baseball, but never like it did in 1944. Many of the games' best players were called away for tours of duty and the result was a seriously depleted pool of talent. The top team in the American League was the St. Louis Browns who collectively batted .252 in route to their only pennant. They only had one .300 hitter in outfielder Mike Kreevich (who barely made it at .301), one man with twenty home runs, shortstop Vern Stephens (who hit exactly twenty); and one player over the eighty-five runs batted in mark, Stephens, who knocked in one-hundred nine runs. On the mound, the Browns boasted Nelson Potter and Jack Kramer who combined for a mediocre thirty-six victories. With outfielder Chet Laabs drilling two final-day homers, the Browns beat the defending champion New York Yankees. The victory, combined with Detroit's loss to Washington, enabled St. Louis to finish one game ahead of the Tigers in the American League. Across town, the other Major League team from St. Louis was doing business as usual. In making off with their third straight National League pennant (leading by 14½ games over Pittsburgh), manager Billy Southworth's Cardinals had won one-hundred five games and ran their three-year victory total to three-hundred sixteen. Like Chicago, New York and St. Louis before them, the "Gateway City" was electrified with the excitement of what was billed as the "St. Louis Showdown". Surprisingly, it was the eight-time National League champion Cardinals who were tenants of the American League's downtrodden Browns in Sportsman's Park which would be the venue for the entire contest. Perhaps as an answer to the lack of pre-game respect they had received in the papers, Luke Sewell's American League titleists came out swinging against their heavily favored rivals for the 2-1 opening victory. Denny Galehouse out-pitched Series vet, Mort Cooper and George McQuinn hit a clutch, fourth-inning, two-run homer that decided Game 1. Unfortunately, the blast would prove to be the Browns' only homer in World Series history. The Cards answered back in Game 2 with Blix Donnelly's stellar relief pitching that tallied no runs, two hits and seven strikeouts in four innings. Ken O'Dea came up big as well with a run-scoring pinch single in the eleventh for the 3-2 victory. The underdogs prevailed again in Game 3 as Jack Kramer pitched a seven-hitter and struck out ten batters on the way to a 6-2 Brown's triumph. With the Americans ahead two games to one, the more experienced Nationals proceeded to show what it takes to play in the big show. Sig Jakucki, the thirty-five-year-old who had won thirteen games for the '44 Browns after being away from baseball for five years, lasted only three innings in Game 4, a contest in which Cards lefthander Harry Brecheen, (16-5 in the regular season) kept the American Leaguers off stride. Stan Musial finished the job with a two-run homer for the 5-1 win. The following day, Cooper, who was coming off of a twenty-two-win season, beat Galehouse with a seven-hit, 2-0 shutout. In the Cardinals' 1942-1943-1944 stranglehold on the National League championship, Cooper had won sixty-five games and thrown twenty-three shutouts. For Game 6, it was Max Lanier and Ted Walks (who both had seventeen wins and shared a 2.65 ERA), that wrote the final chapter to the Brown's "Cinderella season" with a 3-1 victory that wrapped up the Cardinals' second Series title in three years. 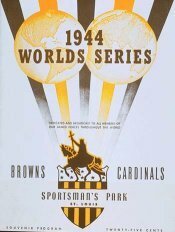 It was the eighth appearance in nineteen seasons for the World Champions, while it was the first (and last) Fall Classic in the Browns' 52-year history. The St. Louis Browns had been members of the American League since 1902, but it took a World War for them to finally reach the World Series. Heightening the drama were their opponents (and tenants in Sportsman's Park), the St. Louis Cardinals. The Browns won their first-ever World Series game, taking the opener 2-1, thanks to George McQuinn's two-run homer in the fourth and nine strong innings from Denny Galehouse. The American Leaguers struck back in Game 3, as Jack Kramer went nine innings and allowed just two (unearned) runs to capture a 6-2 victory. First baseman George McQuinn paced the hitters with three hits and two RBIs. That Brownie glory was short-lived, however, as the Cardinal pitchers hogged the credit in Games 4 and 5. In Game 4 it was Harry "the Cat" Brecheen, who tossed a complete-game nine-hitter to earn a 5-1 victory.